Cooler than average temperatures will persist. The next rainmaker will come by on Saturday. Today and Tonight: Generally sunny skies will stay through Thursday although a few high clouds could mix in due to a weak upper level impulse sliding across the region. Highs will stop in the mid to upper 50s due to continued light, north winds. A repeat of lows in the 30s is ahead on a mostly clear night. Up Next: Clouds will begin to increase on Friday as the next storm system takes shape to our west. 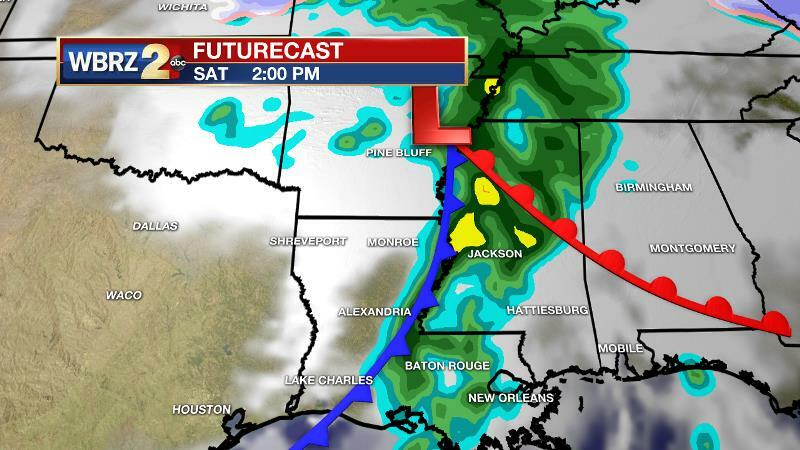 Saturday, a low pressure system and front will move across Louisiana. This will bring scattered showers through much of Saturday, until the cold front brings one final punch of rain prior to ending. We cannot rule out an isolated thunderstorm, but the majority of the system will just be rain. 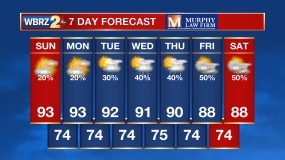 The rest of the extended forecast looks dry. Below average temperatures will last into next week. An upper level trough will remain over the southeast U.S. through Thursday with a strong surface high pressure building in from the north. This will keep cooler than average temperatures in place. Forecast models continue to display a split jet stream and bring a southern branch trough through the region this weekend. Rain chances will increase from west to east late Friday night, but Saturday is when the bulk of rain will move through. Coverage should be around 70 percent with only coastal parishes possibly missing rainfall. Amounts look quite manageable, with maximums around an inch. There may be just enough instability that a rumble or two of thunder is possible; but severe weather is not anticipated. The cold front associated with this system will dry out the local area and usher in cooler temperatures on Sunday. Below normal readings will be maintained through early next week as a weak trough or zonal flow pattern stays in place aloft.